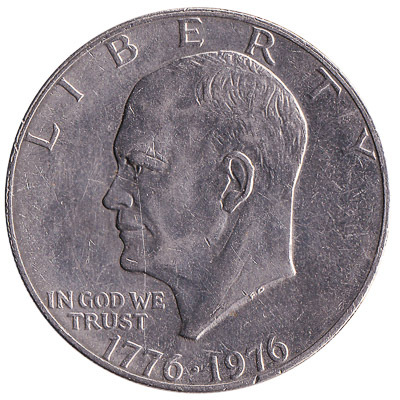 The US Mint issued American Dollar coins in 6 different denominations, including this 1 US Dollar coin (Eisenhower Bicentennial issue). They are part of the American Dollar coins series. The US Mint started issuing these 1 American Dollar coins in 1975. They were withdrawn from circulation in 1976. The Bicentennial issue of the $1 US dollar Eisenhower coin commemorates the 200th anniversary of the American Revolution. It features the Liberty Bell, an iconic symbol of American independence. 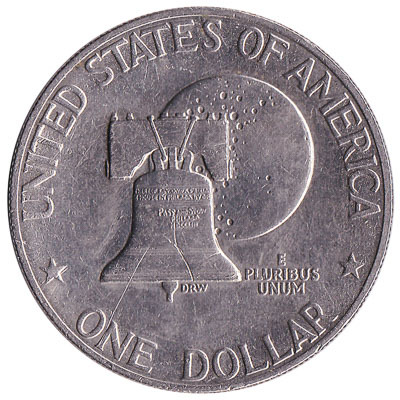 Under a magnifying glass, one will be able to read the text on the Liberty Bell on the reverse of the coin: “Proclaim LIBERTY Throughout all the Land unto all the Inhabitants Thereof”. Repeat these steps for any other notes and coins you want to exchange. Complete checkout and get paid within 5 days of receiving your currencies. To exchange your 1 US Dollar coin (Eisenhower Bicentennial issue) for cash: add it to your wallet now!